Since the year 2000, Rosicrucian Park has resolutely committed to using natural resources as sustainably as possible and to serving as a model for living in harmony with our environment. The beautiful new Native Plants Gardens at Rosicrucian Park, which require little or no irrigation, resulting in a savings of hundreds of thousands of gallons of water each year. More than 2,500 new trees and bushes planted at Ros­icrucian Park, including many that attract and provide habitat for local birds and butterflies. The Rosicrucian Peace Garden is a stunning educational garden, which is authentic to the Eighteenth Dynasty of Ancient Egypt. It also serves as a model for drought tolerant gardening. The new Rosicrucian Labyrinth is the latest manifestation of this commitment. The Rosicrucian Labyrinth is based on the design of the Chartres Labyrinth, which has inspired spiritual wayfarers for at least 750 years. The paths are surrounded by native plants, which create the outline of the labyrinth design. Around that is a new oak grove, sacred in many of the ancient mystery traditions. The paths are sufficiently wide so that guests in wheelchairs can easily navigate the turns and ground level guide rails assist visually challenged guests, making this the first fully accessible Labyrinth in the world. 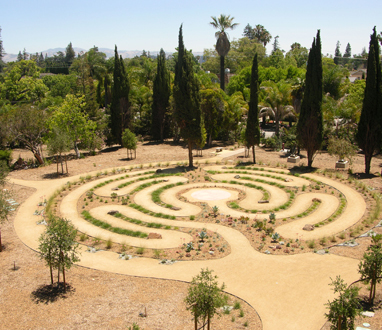 This beautiful Labyrinth, accessible to all, nestled within a sacred grove, provides the opportunity for the hundreds of thousands of members and guests who visit Rosicrucian Park each year to experience its tranquility in new and profound ways. It also demonstrate the benefits of living in harmony with our environment and our natural resources – a principle at the core of the Rosicrucian teachings and a practice especially important at this time in humanity’s history. 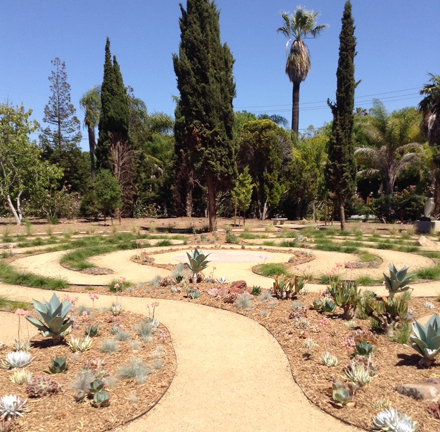 We invite you to support the Rosicrucian Labyrinth with a donation, investing in the future of Rosicrucian Park and participating in the manifestation of the Rosicrucian Order’s commitment to sustainability and to serving as a model to the community. Open daily from 8 am to sunset. "...and in the shifting of the winds, and in the clouds that are pressed into service betwixt heaven and earth, are signs to people who can understand."